Copistar 1.3.5e Main Window - MCG & Comp. LLC - Print any PDF, Adobe Digital Editions, eBook or Mobpocket! Print any PDF, Adobe Digital Editions, eBook or Mobpocket! No more frustration with those unprintable documents! Copistar is a smart, easy-to-use tool that captures an on-screen document - whether printable or unprintable otherwise (protected or not). It will do a tiresome task of capturing a multi-page document. 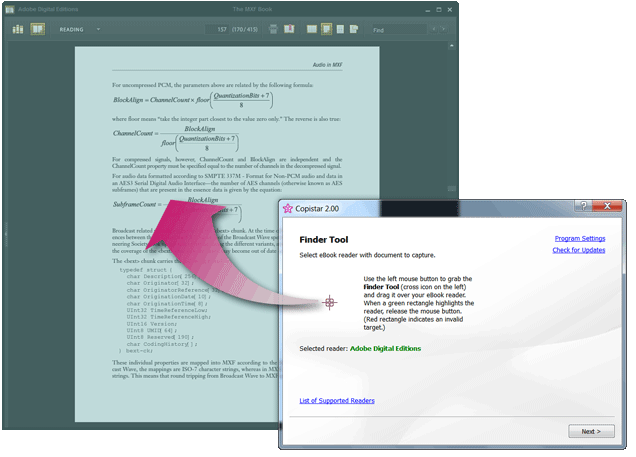 Copistar automatically scrolls through the document, detects its pages and outputs them to a printable PDF. A must-have tool for all ebook owners! Print Conductor - Print Conductor is batch printing software. It prints multiple PDF files, plain texts, Microsoft Office and OpenOffice documents, RTF, HTML, MHT, XML files, AutoCAD, Solidworks, Visio and Inventor drawings, PSD, JPG, TIFF and PNG images in 3 clicks. RPM Remote Print Manager Select 64 Bit - RPM Remote Print Manager (RPM) is our virtual printer product. RPM can convert incoming jobs to other formats, print the same job to multiple printers, send jobs to a printer and save to disk, and print to multiple trays. RPM Remote Print Manager Elite 64 Bit - RPM Remote Print Manager (RPM) is our virtual printer product. RPM can convert incoming jobs to other formats, print the same job to multiple printers, send jobs to a printer and save to disk, and print to multiple trays. PDF-XChange Lite - The junior member of our highly praised PDF-XChange range of software tools aimed at users wishing to create the smallest PDF files available - from any Windows application software. Simple to use - highly efficient. Free 1D Barcode Generator - The programe generates and prints most popular linear and postal barcode symbologies including Codabar, Code11, Code25 family, Code32, Code39, Code93, EAN-2, EAN-5, EAN-8, EAN-13, UPC-A, UPC-E, Code-128, EAN-128, MSI, ITF, DPI, DPL, KIX4S, etc. RPM Remote Print Manager Elite 32 Bit - RPM Remote Print Manager (RPM) is our virtual printer product. RPM can convert incoming jobs to other formats, print the same job to multiple printers, send jobs to a printer and save to disk, and print to multiple trays. Batch & Print Enterprise - Batch & Print Pro is for batch printing documents from a retainable list which can be automatically printed in document sequence of your choice. PDF-XChange Standard - The junior member of our highly praised PDF-XChange range of software tools aimed at users wishing to create the smallest PDF files available - from any Windows application software. Simple to use - highly efficient. Free 2D Barcode Generator - The programe generates and prints most popular matrix and stacked 2D barcode symbologies including Aztec Code, Data Matrix, QR Code, PDF417, Micro QR Code, MicroPDF417, MaxiCode, Code 16K, RSS family, etc.